If you think you are confused about the voting procedure come Polling Day, you are not alone. Your concerns are understandable as some changes have been introduced. An example is the use of indelible ink for the first time in our election history. Here is a guide to the voting procedure. Be familiar with what you have to do. Officers on duty will assist you. I have also appended some instructions to take note of before you go out to vote. They are sourced from Tindak Malaysia's training workshops for polling agents, counting agents and booth agents (PACABA). 1. Be at the polling center early, as there may be a long queue due to the new polling process. Be patient and wait for your turn. Polling centers are open from 8am to 5pm. The polling center gate closes at 5:00pm sharp. If you are already inside, and in the queue, polling will continue till all in the queue have cast their vote, regardless of time. 2. Check online first at the Voter Registration website and print out your details before going to the voting center. You may be able to by-pass the barung counter since you have a printout and know where to go. Here's a sample. Print it out as proof that you are registered. Click here to check your voter registration. 3. Bring your Identity Card (IC). If you have lost your IC, bring your temporary IC. If you have also lost your temporary IC, you can use your passport. But try to avoid using your passport as the counting agents will insist you fill up a Borang 11 which will take time. 4. Make sure your left hand index finger is clean. Any markings or stains will render you ineligible to vote. If you have a band aid plaster on that finger, you may use the right hand index finger instead. The default is the left hand index finger. The elections clerk will mark your left index finger with indelible ink. Ladies, make sure your nails are free of nail polish. 5. Important! The ink will take about 30 second to dry. 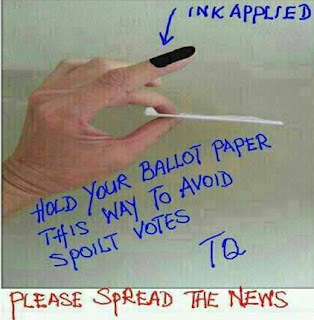 Bring along a tissue to dry off your finger before holding your ballot papers. Any smudge or stain on the ballot paper will render it a spoiled vote. So be extremely careful. 6. Check your ballot paper. It must have a serial number, and clean of any extra marking or words or stains, smudge, pencil/pen marking or dots or tear on all the surface of the ballot paper. YOU CAN REJECT THE PIECE OF BALLOT PAPER AND INSIST ON A NEW ONE IF YOU SEE ANY OF THE ABOVE. Do not be intimidated by anyone there as this is your ABSOLUTE RIGHT. 7. Ensure that the clerk who hands you the ballot paper, does not write the serial number of your ballot paper next to your name on the list. He or she is supposed to just neatly cross out your name on the list. If you notice that she has written something, please raise the matter with the chief officer immediately. 8. In the event you are told that you have already voted, even though you have not, and your index finger has no ink stain, you MUST raise your objection immediately. It could mean that somebody has voted on your behalf. You will be required to fill forms to lodge your complaint. Remember, it is your constitutional right to vote. 9. Do not wear any t-shirt or buttons or hat that is aligned to any of the political parties. You will be asked to remove the item, or be disallowed to enter the polling center. 10. When casting your vote, be careful not to make any other marks on the ballot paper. You will be using a pen instead of the usual pencil. So if you make a mistake and it is accidental, please request for a new ballot paper. 11. 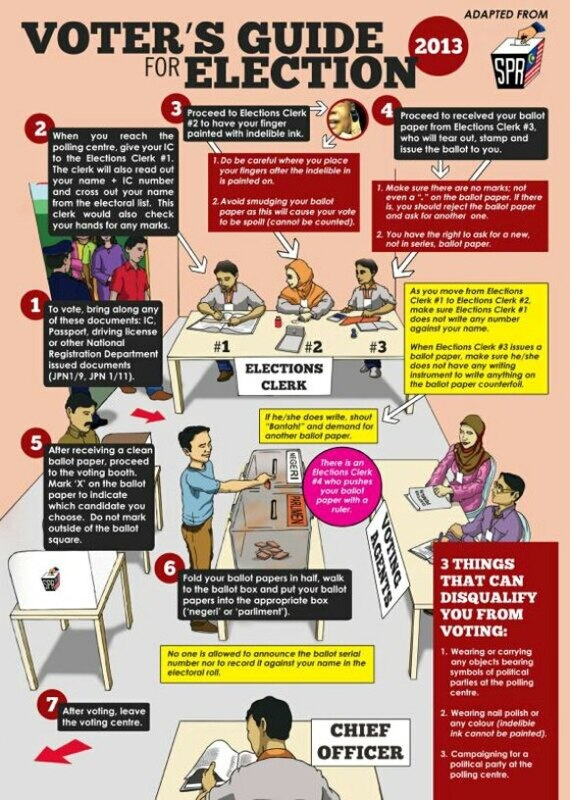 Fold the ballot paper neatly in half checking to see that all is in order before proceeding to the ballot boxes. There will be two ballot boxes - one for Parliament and the other for State. 12. At the ballot boxes, SHOW and put the ballot papers into the corresponding box. Stand there to ensure that the officer pushes your vote into the box. Please do not have any tissue or other paper in your hands as you may be stopped for a search by the polling agent before you leave the room. What constitutes a spoilt vote? Below are some samples of spoilt votes. It would be a shame to waste your vote through carelessness, so do take heed. These images are taken from yesterday's New Sunday Times. If you have friends who are not Malaysian citizens, please advise them to stay away from all polling centers. They may want to observe out of genuine curiosity, but if they are mistaken for illegitimate voters, they may get into trouble. Please vote wisely. It is your right to choose who you want to vote for. So please vote wisely. Do not let anyone influence you. Decide for yourself. 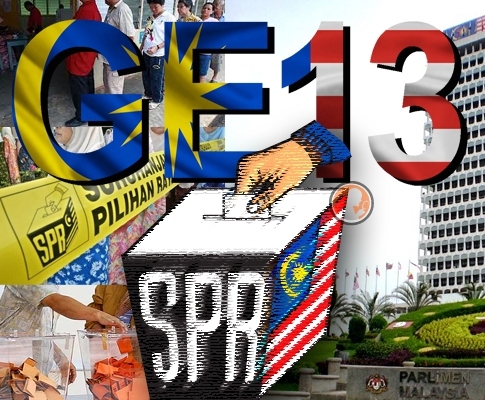 For more information on the 13th General Elections (PRU-13), visit the Elections Commission portal. If you prefer to view shorter videos on voter education, click here for a wider selection. 1. If you have voted in the past and your name is not online now, YOU CAN STILL VOTE AT THE SAME PLACE YOU VOTED LAST. KINDLY GO BACK TO THAT SAME VOTING CENTRE/SCHOOL AND ASK THE OFFICERS AT THE PAKATAN BOOTH THERE TO CHECK YOUR NAME MANUALLY FROM THE SPR SUPPLIED HARDCOPIES (NOT ONLINE). 2. 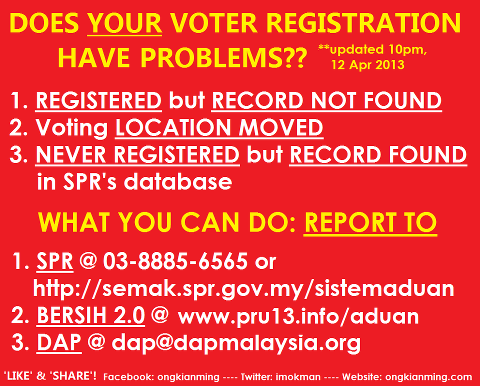 Please check if you have been registered on the SPR website EVEN IF YOU HAVE NOT REGISTERED BEFORE. This is because there are many cases of unregistered voters whose names appear on the SPR website probably to allow phantom voters to use these ICs. If you fall into this group, kindly note that YOU ARE ELIGIBLE TO VOTE DESPITE THE FACT THAT YOU HAD NOT REGISTERED BEFORE. In uch cases, kindly go to the respective voting centres/schools to csast your vote as early as possible, preferably by 7.45 a.m. (voting commences at 8.00 a.m.), to avoid such phantom voters using your IC numbers to cast a vote. 3. For those who registered before 31.12.2012 but whose names do not appear online now, THERE IS A HIGH POSSIBILITY THAT YOU ARE REGISTERED AND CAN VOTE. If you fall into this category, please visit/call your local prospective Pakatan ADUN or MP's operation centre and ask for your name to be checked manually from the SPR supplied hardcopies (NOT online). 3. 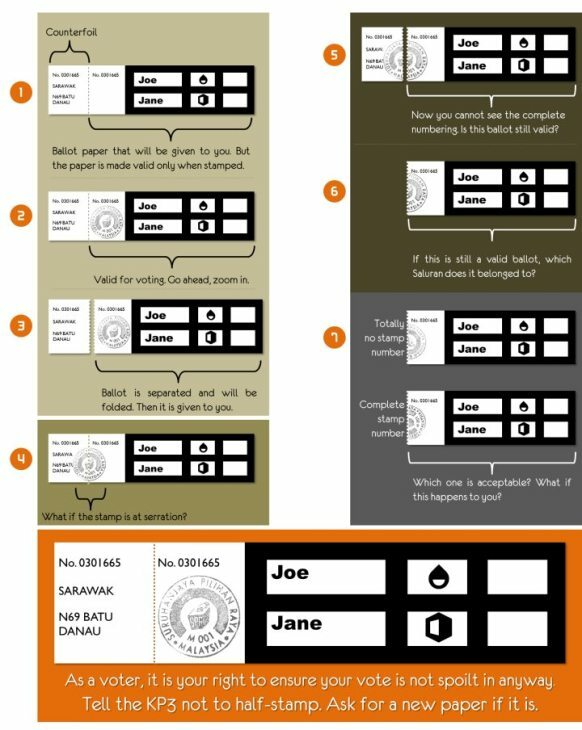 If you find that your IC number has been used when you vote and you are unable to do so as a result, IMMEDIATELY lodge a police report or leave your contact details with our Pakatan agents at the respective Pakatan booths at your voting centres/schools. 4. DO NOT GIVE YOUR IC OR A COPY OF IT TO ANY PARTY FOR ANY REASON UNDER ALL CIRCUMSTANCES. 5. If your voting centre/school that appears on the SPR website online now is different from the voting centre/school you voted at the last time, please make an effort to vote at the new voting centre/school that appears online now. 6. PLEASE MAKE AN EFFORT TO CAST YOUR VOTE AS EARLY AS POSSIBLE, PREFERABLY BY 7.45 A.M. (VOTING COMMENCES AT 8.00 A.M.), TO AVOID POTENTIAL VOTING IRREGULARITIES. 7. This message will be constantly updated upon discovery of other methods of fraud. 8. Please share this message with as many people as possible.